Caroline’s family begins to struggle soon after her beloved father leaves to fight in the Civil War. Not only is his absence a massive burden, but to add to their distress, months after he leaves, Caroline and her mother discover an unsettling truth about her father. After investing all of his savings in an unsuccessful business, the family is suddenly faced with even more obstacles to overcome as debt collectors come to take what’s due to them. Soon, Caroline begins to feel like a burden to her family due to her age and decides that it’s time for her to attempt to flap her wings and fly away from the nest. Her decision will benefit her family tremendously because this frees up room for her wealthy grandmother to move in and help her struggling mother and siblings. 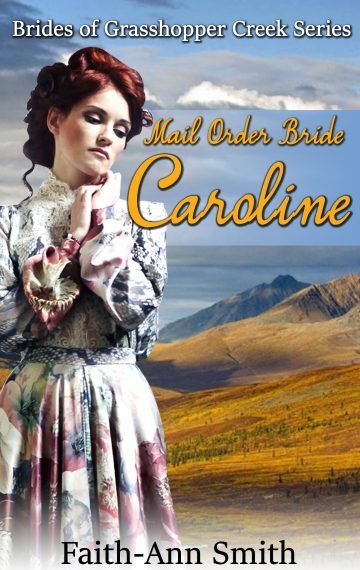 The Lord guides Caroline to an ad in the newspaper from a gold miner in Bannack, Montana who is searching for a lovely woman to become his bride. Soon, she joins the wagon train and anxiously makes the journey out west to start her new life. When she arrives in Bannack, however, she discovers that the man she chose may not be the man she thought he was. She must decide where her loyalties lie—and if she can find it in herself to look beyond Bailey’s past and accept him for the man he is today.